Instagram is the must-have app for most travellers, foodies and fashionistas around the globe. The Facebook-owned photo and video sharing network claims to have over 400 million Instagrammers and hopefully a sizeable Indian population for Indian brands to truly invest into the app. But, here’s an Indian startup that has actually built its own app within Instagram. Negating all spends on app creation and marketing, the startup has leveraged Instagram itself, or rather a feature of Instagram to let users experience the brand within Instagram. 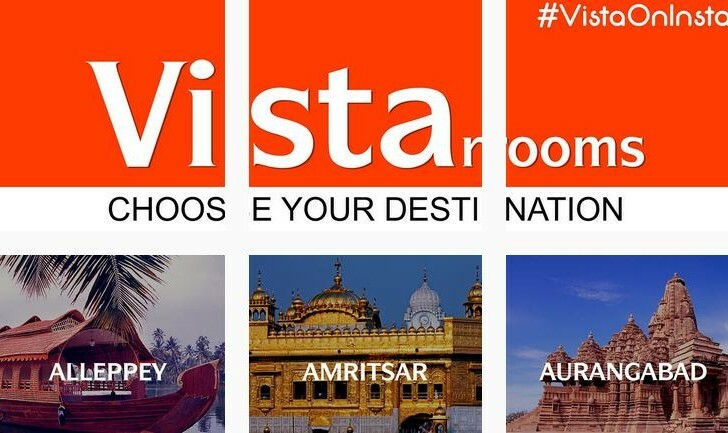 Vista Rooms, branded hotel chain providing low-cost luxury stays across India has created its own app on Instagram by applying a cool twist to Instagram’s tagging feature. Search for @vistarooms_app on Instagram. The account is filled with photo locations. Tapping these photos and clicking on the popup leads us to all the Vista rooms in that location. You can also find a tile for each of the property like food, places of interest, culture. I clicked on Amritsar and tapped and clicked on the popup that led me to the rooms in Amritsar. Once you have seen the amenities and other features, click the link in the bio to book the room. The link leads to the regular Vista website on your mobile. And, yes the site is a mobile-friendly one! In the age when companies are jostling for some megabytes on your smartphone even while you are juggling amongst multiple apps as to which ones to keep and which to uninstall, this #VistaonInsta is a cool idea by Vista Rooms. Tap, tap, tap and a user is led to the required information and call to action link on its website. There’s no need to convince an aspiring hotel hunter or avid travel buff to install the Vista app; besides Instagram is an app he/she would anyways have. #VistaOnInsta is a cool leverage of the tagging feature provided by Instagram. Although the concept of using Instagram tagging feature other than what it is meant for, isn’t a novel one, I haven’t heard of any company building a completely functional app all within another popular app like Instagram, using just its photo tagging feature. Last month, Reynolds Kitchens, the company that helps keep food fresh, laid out a giant dinner table made up of 21 dishes on its Instagram page. Each dish linked to another Instagram account that laid out all of the individual ingredients in the dish and featured a link to the Reynolds website with the recipe. Back home, we had Zee Khana Khazana take advantage of Instagram’s tagging feature to create ‘#InstaCookBook’ – a collection of summer recipes, where each block linked to another Instagram account with pictures of the recipe and recipe links to the website. The idea was to create a summer food guide.